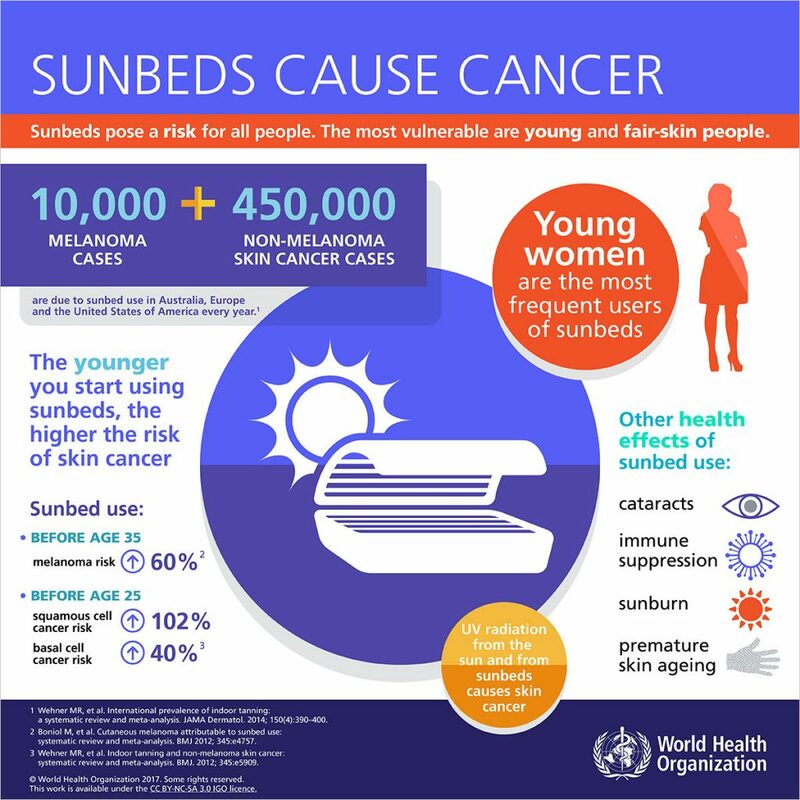 The WHO recently release the infographic below which indicates that sunbeds undeniably cause cancer. Natural UV radiation reaching the Earth’s surface consists of approximately 95% UVA and 5% UVB radiation. Tanning parlours use different types of sunbeds, and the use of UVA vs UVB differs between sunbeds. Forced tanning is associated with DNA damage in melanocytes, the cells that produce the dark-coloured melanin pigment in the skin. Forced tanning, even a small tanning effect, requires a lot of DNA damage in the fair-skinned population. Therefore, regular use of sunbeds will significantly increase your chances of getting skin cancer if you are fair-skinned. The new technology sunbeds are said to emit “safe” UV radiation. However, the original presumption that UVA is a safe form of UV radiation does not hold. If nothing else, it enhances skin ageing but, most likely, UVA also plays a role in skin cancer promotion. Assuming the average UVA and UVB levels of the sunbeds tested, the carcinogenic effect of sunbed use over a period of 10 minutes corresponds with an exposure to 10 minutes of Mediterranean summer sun. Regular sunbed use therefore contributes significant amounts to the user’s annual UV radiation exposure, especially as it involves whole-body exposure – the exposed skin area in sunbed tanning is at least twice as large as the average sunbather’s. 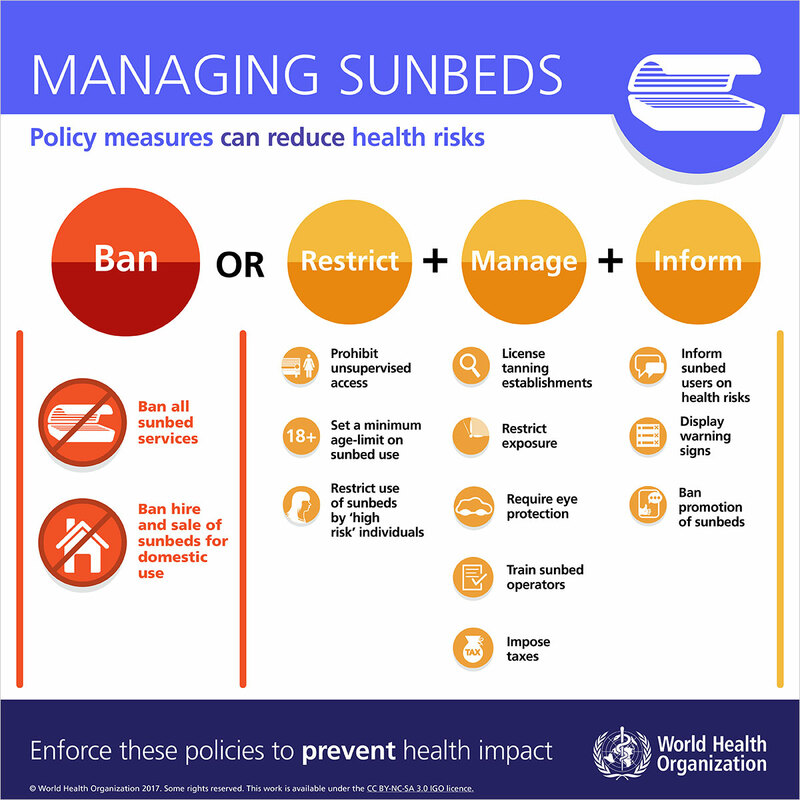 The International Commission on Non-Ionizing Radiation Protection states that “the use of sunbeds for cosmetic purposes is not recommended.” Regular exposure should not exceed two sessions per week with a maximum of 30 sessions per year. The use of eye protection such as goggles or sunglasses should be mandatory. However, as sunbed users aim to have an even tan, they often decide against protecting any part of their body. Users have reported a range of short-term symptoms including itching, dryness and redness of skin, freckling and photosensitivity. Common long term outcomes, especially in fair-skinned people, may involve blistering of the skin. Sagging and wrinkling of the skin are an almost certain price to be paid by frequent sunbed users. Basically, you might be browner but you’ll age a lot quicker. The sun is strongest between 10 a.m. and 4 p.m. When possible limit exposure to the sun during these hours. take special care to adopt sun safety practices when the UV Index predicts exposure levels of moderate or above. A hat with a wide brim offers good sun protection for your eyes, ears, face, and the back or your neck. Sunglasses that provide 99 to 100 percent UV-A and UV-B protection will greatly reduce eye damage from sun exposure. Tightly woven, loose fitting clothes will provide additional protection from the sun. Apply a broad-spectrum sunscreen of SPF 15+ liberally and re-apply every two hours, or after working, swimming, playing or exercising outdoors. Sunscreen should never be used to prolong the duration of sun exposure. I believe all children should be required to wear a bucket hat during break-time at school, and put sunscreen on their faces and arms during break and sports. Every child should also carry a 500ml reusable water bottle that they can refill as needed throughout the day. This blog post was summarized from a WHO article. If you are interested in reading the full article, I have pasted the link below, and the link to the UV page on the WHO’s website. They are both well worth a read.